The TVR V8S sports car, a two seater convertible, was launched in 1991, and was the successor to the TVR S4C. This developed 240 bhp at 5250 rpm, and 270 ft/lbs of torque at 3000 rpm, and gave it a top speed of 146 mph, a 0-60 mph time of 4.9 secs, and a 0-100 mph time of 12.9 secs. In order to handle the additional power, it was fitted with limited slip differential, the gearbox used was from the Rover SDI saloon, and the rear drums were replaced with disc brakes. Shortly after the launch, the chassis was strengthened in order to reduce flexing. Such performance meant that it was faster, in terms of acceleration, than many of the Supercars of the early 1990's, including the Porsche Carrera 2, Ferrari Testarossa, Lotus Esprit Turbo SE, and Aston Martin Virage. 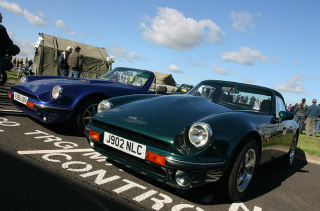 A distinguishing feature between the V8S and the TVR S was that the bonnet of the former contained a large power bulge, as used in the variant targeted at the Italian market. Standard equipment on the V8S included leather interior, a walnut dashboard, the hood made from mohair, OZ alloy wheels, and electric windows and mirrors. The width of the track had been slightly increased, and there were disc brakes on all four wheels. Production of the TVR V8S ended in 1993 when over 400 units had been built. A limited edition of just one unit was the 2 litre TVR V8S sports car, specifically designed for the Italian market. It used a modified 3.5 litre, Rover V8 engine, with a shorter stroke, so that the capacity was reduced to 1998 cc. With a compression ratio of 8.0:1, it was fitted with Lucas fuel injection, and an intercooled Eaton supercharger. This developed 230 bhp at 6200 rpm, and 196 ft/lbs of torque at 3700 rpm, which produced a top speed of 144 mph, and a 0-62 mph time of 6.5 secs. There were vented disc brakes at the front, and adjustable hydraulic shock absorbers. In 1988, TVR introduced what they described as the new TVR Tuscan sports car at the London Motor Show. Powered by a Rover V8 engine, and with flowing lines and stunning looks, it eventually became sidelined to the race track having been originally earmarked as a production car. In 1989, the prototype TVR Speed-8 was showcased at the London Motor Show. It was to be the successor to the TVR 350i, utilising a Tasmin wedge shape body with the edges smoothed off. However, it failed to make an impression on the market, which preferred the body styling of the TVR S.
Consequently, to satisfy the market, the TVR V8S was introduced, in 1991, as a stop gap measure prior to the forthcoming launch of the TVR Griffith, which was to use, initially, the same 3948 cc, V8 engine. The creation of the Griffith introduced a new era in the company's fortunes. A 1991-93 TVR V8S with a high mileage could fetch in the region of £11,000/$18,000.